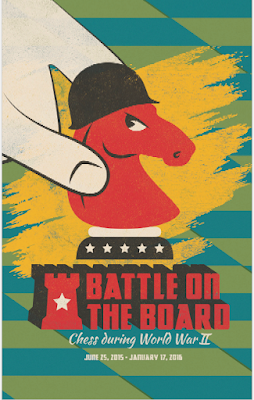 Saint Louis may not be on your doorstep, but you can get a decent look at the Saint Louis Chess Campus exhibition Battle on the Board: Chess during World War II (on show until January 17 2016) on-line here. The comprehensive curator's note and overview, with an introduction by IM John Donaldson, is linked above. This how they describe the exhibition: "it includes prisoner of war chess sets from the collections of the National Museum of the Marine Corps and National Museum of the United States Air Force, archival material from the John G. White Chess Collection at the Cleveland Public Library, and highlights from the collection of the World Chess Hall of Fame." But the exhibition is not just about chess sets. It is also about the role of the game in maintaining the morale of American WW2 combatants (and others) on the battlefield, in R&R, and in POW camps. It is a nice complement to our own series War Game (accessible via our History Index). They are also showing another exhibition of Marcel Dzama's chess themed art: until 18 October 2015 (we checked out a show of Dzama's chess art in London in 2013). There are fulsome notes about Dzama and his exhibition on the Chess Campus website. If you should come to this post after the close of the exhibitions you should find the notes in their exhibition archive. Thanks for the link to this webpage. I would very much like to see this interesting exhibition in real life. The presented war chess sets remind me of a chess set which I inherited from my grandfather. It was a german paper-made so called field chess (Feldschach, meaning battlefield in this context) which seems to have been produced in high numbers for the soldiers. Such luxurious versions as shown on the above mentioned exhibition-website never met my eye in my whole life. The field chess of my grandfather was more similar to the American Red Cross Pocket Set also shown on the linked web page, but it was black and white in colour and the symbols of the pieces where not fully flat, but of a considerable thickness, a relief in fact, as shown on another picture on the website, the picture of the Feldpost Chess Set, albeit this one has a totally different kind of board (and also the red colout instead of the white one of the Feldschach Set I own). The Feldschach board could be folded to a square of the size of 1/4 of the full board size, just like it seems to be the case with the American Red Cross and the German Feldpost Chess Sets. I've never used mine so far. However, it often reminds me to my grandfather who seemed to be a very nice and respected man in our village and who died when I was only seven. Seeing the field chess set, I always wondered what he might have done and experienced in war... I never got to know it. Ulrich - Thank you for your interesting and thoughtful comment. Perhaps you would be kind enough to let me have your email address (email us at chesscomments@gmail.com - marked "not for publication" and include a contact email address). Perhaps then we could discuss a blog on your grandfather's set.